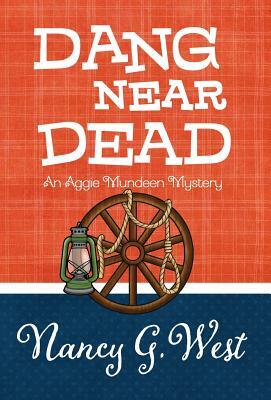 A SATISFYING MYSTERY WITH COMPLEX CHARACTERS... Sub-Genre Tags: Humorous Mystery, Amateur Sleuths, Women Sleuths, Southern Mystery Aggie vacations with Sam and Meredith at a Texas Hill Country dude ranch with plans to advise her column readers how to stay young and fresh in summer. Except for wranglers, dudes, heat, snakes and poison ivy, what could go wrong? When an expert rider is thrown from a horse and lies in a coma, Aggie is convinced somebody caused the fall. Despite Sam's warnings, Aggie is determined to expose the assailant. She concocts ingenious sleuthing methods that strain their dicey relationship as she probes secrets of the ranch and its inhabitants. After she scatters a hornet's nest of cowboys, she discovers more than one hombre in the bunch would like to slit her throat. Praise for DANG NEAR DEAD: "Spiced with up-and-down encounters between Sam and Aggie-she thinks she loves him but is determined to solve the crime despite Sam's warnings-make Dang Near Dead a satisfying mystery with complex characters and a plot that builds to a satisfying crescendo." - Diane Donovan, Midwest Book Review Books in the Aggie Mundeen Humorous Mystery Series: FIT TO BE DEAD (#1) DANG NEAR DEAD (#2) SMART, BUT DEAD (#3) March 2015 Part of the Henery Press Mystery Series Collection, if you like one, you'll probably like them all... Author Bio: Nancy G. West's poem, "Time to Lie," was featured by Theme and Variations and broadcast on NPR. For three years, she wrote Book Shelf, the book column for San Antonio Woman magazine as well as articles for other publications. But a funny thing happened as she finished Nine Days to Evil, her award winning novel of psychological suspense, Shakespeare, and nonstop-action. A supporting character, Aggie Mundeen, with her wry sense of humor, took over West's consciousness and demanded that West write a book about her...or maybe a series. The result, Fit to Be Dead, was 2013 finalist for the Lefty Award for Best Humorous Mystery. Next came Dang Near Dead, and West is currently at work revealing Aggie's third and fourth romantic mystery adventures. Aggie is pleased.